WARNING: This is a "PAL" product and CANNOT be used with USA/NTSC systems. The black JVC Everio GZ-R435BEU Quad-Proof HD Camcorder with 40x Optical Zoom records 1080p50 HD AVCHD video at bit rates up to 24 Mb/s. This camcorder records PAL compatible signals and is not compatible with NTSC broadcast standards. 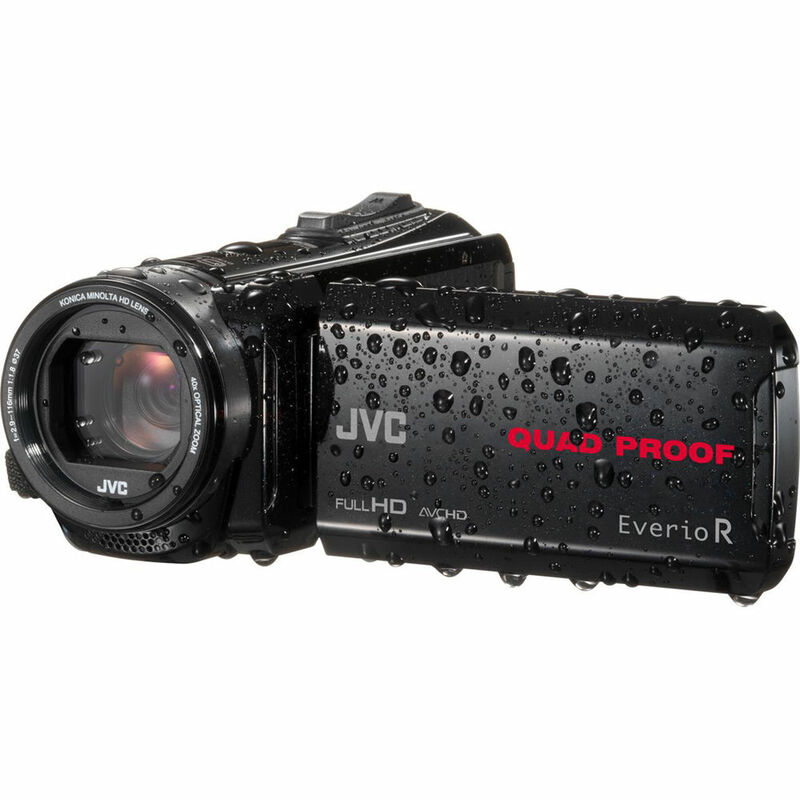 Designed with JVC's rugged Quad-Proof camera body, the Everio GZ-R435BEU is built to capture your adventures no matter the weather. This rugged camcorder is waterproof down to 16', shockproof from falls up to 5', dustproof, and freeze-proof down to 14°F. The camera's back-illuminated 2.5MP CMOS sensor uses JVC's Falconbrid image processor to record 1920 x 1080 HD video to SD/SDHC/SDXC media cards, or to the 4GB of internal memory storage. Still photos can be captured in either 4:3 or 16:9 aspect ratio. The Everio GZ-R435BEU's Konica Minolta HD lens features a 40x optical, 60x dynamic, and 200x digital zoom. Advanced image stabilization (AIS) reduces camera shake when handholding the camera. View while recording and playing back footage on the 3" touchscreen LCD. Image capture features include time-lapse recording, face detection, and special effects like Grainy B&W, Food, and Baby modes. Additional camera features include a rechargeable internal battery lasting up to five hours, a built-in zoom microphone, and 37mm filter compatibility. Box Dimensions (LxWxH) 6.0 x 5.5 x 5.2"
Cannot view the specs or overview. Is there any reason for this?